Kenneth S.Barker,"Presbyterians in Search of a Presbytery; or the Search for Pure Worship." The Canadian Society of Presbyterian History Papers XXVII (2002): 32-38. John WebsterGrant, "Brands from Blazing Heather: Canadian Religious Revival in the Highland Tradition." The Canadian Society of Presbyterian History Papers XVI (1991): 59-74. John A. Johnston,"Ticket to Heaven: The Rise and Fall of the Communion Token." The Canadian Society of Presbyterian History Papers XI (1986): 15-21. Hugh McKellar, "150 Years of Presbyterian Hymnody in Canada." The Canadian Society of Presbyterian History Papers XI (1986): 1-13. Hugh McKeller, "The Books of Praise of 1897 and 1997: Kith, Kin, or Kissing Cousins?" The Canadian Society of Presbyterian History Papers XXIV (1999): 17-22. Janis Zubalik,"A Modern Montreal Church: The Erskine Presbyterian in 1894." The Canadian Society of Presbyterian History Papers XIX (1994): 147-161. When Canada was acquired by Great Britain in 1763, English laws prohibiting work and entertainment on Sunday came into effect in the new colony. In 1845 the province of Canada passed its own law forbidding anyone in Upper Canada "to do or exercise any worldly labour, business or work of one's ordinary calling", except for certain works of necessity or charity. At Confederation, when the BNA Act created our two-tier legislative constitution (federal and provincial), Sunday closing laws came (or seemed to come) under provincial jurisdiction. A quiet Sunday was the social custom in Protestant Canada (Roman Catholics were mellower about it). If water had to be drawn or potatoes peeled for Sunday dinner, many made sure to do it on Saturday evening. Laundry was not hung out to dry on Sundays. "Even the irreligious usually went to church on Sunday; the religious went more than once" (Grant, The Church in the Canadian Era, p. 10), and "a great many Canadians spent the rest of the sabbath reading religious books or periodicals." As an illustration of the Victorian Sunday, consider the following illustration, "Toronto: Sunday preaching in the park," published in 1879. "Canadian Illustrated News, Vol. 19, No. 21, Page 329. Reproduced from Library and Archives Canada's website Images in the News: Canadian Illustrated News." With the growth of cities, commercial pressures for the relaxation of Lord's Day observance increased. Hamilton began running its streetcars on Sunday in 1874, which outraged the Protestant churches, and the Evangelical Alliance protested sharply. Principal Caven of Knox led an unsuccessful protest in 1888 against running streetcars in Toronto. 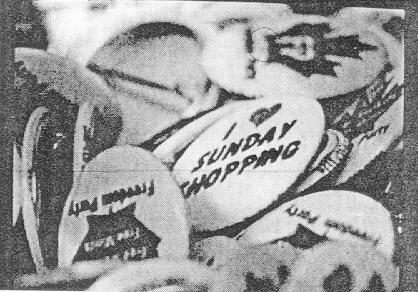 The Lord's Day Alliance was founded in 1888 to uphold what it called "the English Sunday." John Grant notes that sabbatarianism was moving from the agenda of personal morality and church discipline to the agenda of social reform because of an increasing sense that society could improve moral inclinations by controlling the environment (Profusion of Spires, 1988, p. 189). Lord's day observance was "the most conspicuous behavioural pattern by which the province [of Ontario] symbolized its recognition of God's dominion over it." Presbyterians were the most passionate against the desecration of the Lord's Day, and among Presbyterians the leader was J.G. (John George) Shearer, a Knox College graduate of 1888. Described by the Dictionary of Canadian Biography as "one of the most tireless moral reformers Canada has ever had," he left the pastorate in 1900 to become the first dominion general secretary of the LDA. In 1907 he would be a founder of the influential Moral and Social Reform Council of Canada, later called the Social Service Council of Canada. In 1903, in hearing an appeal of a decision about the Sunday operations of the Hamilton Street Railway, the Privy Council in England struck down all Canadian provincial Sunday closing laws, on the grounds that these constituted criminal legislation, which by the BNA Act belonged exclusively to the federal government. In response, Shearer spearheaded a campaign joined not only by the Protestant churches but also by the Roman Catholic hierarchy and the labour movement to persuade the federal government to enact Lord's Day legislation. It was considered a huge victory against powerful commercial interests when the federal Lord's Day Act was passed in 1906. It prohibited sport, entertainment, and almost all commerce on Sundays, although it permitted provincial governments to make exceptions. A PDF-format history of Sunday laws in Canada is available online from Human Resources and Skills Development Canada. Published sources include Law Reform Commission of Canada, Sunday Observance (Ottawa: Ministry of Supply and Services Canada, 1976); Susan Swift, Sunday Shopping: A Legislative and Judicial History, Legislative Research Service, Current Issue Paper no. 119 (Toronto: Ministry of Government Services, 1991). See also M. Valverde, The Age of Light, Soap and Water (Toronto: McClelland & Stewart, 1991). Sentiment began turning against Lord's Day legislation in the 1960s. In that decade Parliament passed amendments to the Lord's Day Act to permit cultural and recreational activities, agricultural and trade shows, scientific exhibitions, and horse racing. In 1985 the Supreme Court of Canada, in R. v. Big M Drug Mart Ltd., voided the Lord's Day Act as an infringement of the freedom of religion section of the Charter of Rights and Freedoms of 1982. The following year, however, it upheld the provincial Retail Business Hours Act of the province of Ontario in R. v. Edwards Books and Art, on the grounds that this had a purely secular intention. However, in 1992 the Ontario government repealed the section of this act dealing with Sundays, and most other provinces have also done the same with similar laws. Anglican, Baptist, Methodist, and Presbyterian Sunday worship felt rather the same, except for the Anglican ritualists noted below. There were morning and evening services, with youth group meetings and Sunday school too. In large churches the minister typically made himself available by the font in the afternoon for baptisms. The focus of the service was the sermon, which in a church of any importance ran typically close to an hour, though some churches had two-hour or three-hour sermons. Theologically the content of the sermon fell somewhere on a spectrum from conservative evangelical to liberal evangelical. In Toronto, the great preaching street was Bloor Street, where you could be guaranteed of a great sermon whether you entered Bloor Street Presbyterian, Trinity Methodist (pictured here), Walmer Road Baptist, or St. Paul's Anglican. Hymn-singing was becoming popular, and denominations were beginning to publish hymn-books which replaced congregational collections. Many of the same hymns were enjoyed in the different denominations. "Thou" and "thee" were used to address God. The King James Version of the Bible was commonly used until the Revised Version made its appearance in 1881. There were small differences in appearance. Anglican clergy wore surplices and Presbyterian clergy Geneva gowns, for example; Methodist churches were commonly built in "auditory" style and Anglican churches in gothic revival, and Baptist churches had baptismal tanks for immersing adults (and young adults). And Anglicans had their prayer book. The old distinctives, such as Methodist itineracy, and the once familiar differentiations, such as Methodist revivalism and Anglican anti-revivalism, were no longer common. "Methodism moved towards the centre of the religious structure, where it met the Anglicans, who for a number of reasons had left their old establishment position" (William Westfall, Two Worlds, 1989, p. 53). See Keith Clifford, "The contribution of Alexander Macmillan to Canadian hymnody," in William Klempa, ed., The Burning Bush and a Few Acres of Snow. The party quarrels of churchmanship in Canada began in the 1830s and reached a peak in the 1870s. These began as issues about the authority of bishops and the acceptability of ecumenical collaboration, but by the 1860s they were beginning to centre on ritual. 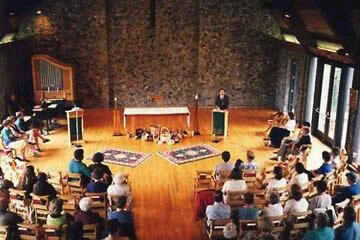 The "evangelical party," which came to be called "the low church," thought that ceremonial innovation was illegal (that is, a violation of statute law in England, and a violation of canon law in the Church of England in Canada), whereas ritual advocates argued that it symbolized the importance of tradition, the grace of the sacraments, and the authority of the Church. Examples of ceremonial innovation are given in Document 36, from the provincial synod of 1867 which condemned these points of ritual (virtually all of which are very common in Anglicanism today). Canadian Anglicans were much influenced by the Liturgical Movement after the Anglican Congress in Minneapolis in 1954. This movement, which began in the Roman Catholic church, sought an ecumenical style of worship, centred on the Eucharist, inspired by what was passed for the rediscovery of a common liturgical tradition in the early Church. Its premises are laid out in the "Preface" to the Book of Alternative Services (1985), Document 39. In the United Church several liturgical leaders, notably David Newman of Emmanuel College, advocated its use, as is seen in A Sunday Liturgy, briefly excerpted in Document 38.